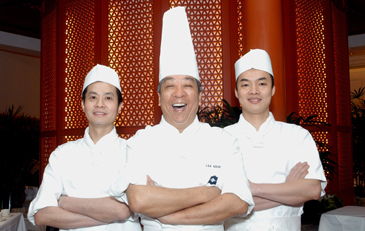 Chef Lee Keung poses with his fellow workers at Palsun Chinese restaurant in Shilla Hotel, Seoul, Korea. Palsun, the first Chinese restaurant in Korea and based in The Shilla, Seoul, introduces the Cantonese cuisine of top chef Lee Keung from June 3 to June 9, 2005. Chef Lee Keung hails from the Summer Palace, at the Shangri-La in Hong Kong which was voted as one of the best 10 hotel restaurants in the world last year by Hotels magazine, a US publication. Cantonese cuisine is one of the most popular Chinese cuisines and the menu features specialities and seasonal favorites expertly prepared by chef Lee and his kitchen staff. In The Palsun restaurant, The Shilla this a treat that should not be missed. Aged 57, chef Lee has a reputation that proceeds him including 42 years experience working in five star hotels and exclusive Chinese restaurants. He now manages all the Chinese reaturants in the Shangri-La Hotels and Resorts group. His career took off a long time ago but he still loves to create innovative new menus constantly. He is so highly regarded that the local media have given him the title "God of the Kitchen." Some of chef Lee's most famous self-created specialities include dishes such as, Scrambled Egg White and Diced Scallops with Crab Coral,Deep-fried Chicken Wings with Crabmeat and Shark's Fin Stuffing and Chilled Sago Cream with Mango Juice and Pomelo. "Confucius Is King in Land of Morning Calm"